The Isle of Man’s Andrew Dudgeon thrilled the local crowd with a win in today’s Mylchreest Motors Junior Manx Grand Prix, overcoming Maidstone’s Tom Weeden on the last lap and setting a new race record for the class in the process. Dudgeon, on the Team Slick Performance Racing Suzuki, joined some of the greatest names in Motorcycling history in winning today’s Mylchreests Motors Junior Manx Grand Prix, following previous winners such as Freddie Frith and Bob McIntyre as well as TT rider liaison officer Richard ‘Milky’ Quayle who won the corresponding race in 1999. After heavy overnight rain on the Isle of Man the race finally got underway at 11.45am after a delay of an hour and a half to allow the roads to dry. Ahead of the start riders were advised of damp patches all around the course, notably under the trees at Ballacraine, Black Dub, Laurel Bank, Glen Helen, Ramsey Hairpin and Governors Dip. Guest of Honour Tom Dickie, who was celebrating the 50th anniversary of his 1966 Senior Manx Grand Prix Senior win, started the race. 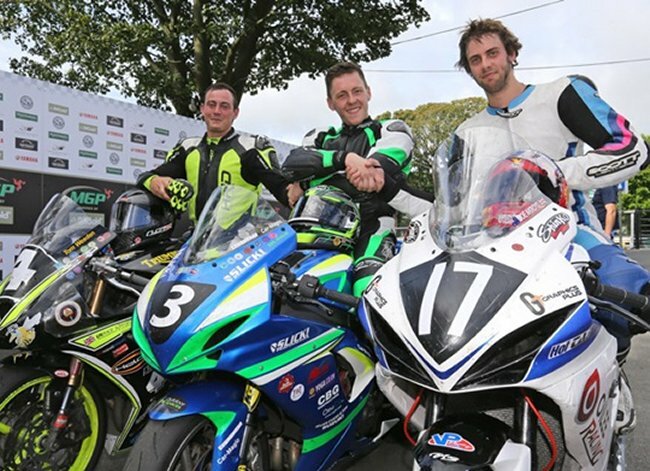 Andrew Farrell, who finished third in the 2014 Junior MGP Race, was first away followed by 2014 Senior MGP runner up Michael Moulai, on a Des and Dot Collins Kawasaki, from New Zealand. Dudgeon, who was the fastest qualifier, was third away from the start line followed by Weeden. Farrell on the B&W Racing Honda was first on the road to Glen Helen, and the Skerries man had already established a four second lead over Dudgeon. However, Weedon, riding a Triumph, was the early race leader less than a second ahead of Farrell at the opening timing point with Northern Ireland’s Dennis Booth in third, narrowly in front of Dudgeon with Moulai completing the top five. Dudgeon moved ahead of Booth into the top three at Ballaugh and was the fastest through the Sulby speed trap at 171.2mph and the top three remained the same at the Bungalow with Weeden’s lead 2.7 seconds over Farrell with Dudgeon a further five seconds back in third and Moulai edging narrowly ahead of Booth into fourth. Weeden’s opening lap of 119.060 (19.00.835) gave him a two second lead over Farrell (118.846/ 19:02.886) with Dudgeon (118.295/ 19.08.215) a further five seconds back in third. Moulai (116.653/ 19:24.379) was in fourth with Barry Lee Evans, on the Percy’s Autos Kawasaki, moving into the top five with 116.619/ 19:24.717). Dudgeon moved narrowly ahead of Farrell at Ramsey on the second lap and was nine seconds behind race leader Weedon. However, with Weedon clearly losing time on the last sector from Cronk Ny Mona to the Grandstand, the gap was down to four seconds coming into the pits at the end of the second lap between the leading pair with Farrell a further 8 seconds behind in the final podium place. Barry Lee Evans maintained fourth place 26 seconds behind Farrell with Knaresborough’s Joe Akroyd, competing on the Oilee Racing Suzuki, moving into the top five at the Grandstand ahead of Moulai. Although Weedon gained three seconds on Dudgeon in the pits, the deficit was down to 3.7 seconds at Glen Helen on the third lap, and Dudgeon reduced this further to only 1.5 seconds by Ramsey. Farrell was a further 23 seconds behind Dudgeon, which included over six seconds lost to the Manx rider in the pits. Dudgeon’s third lap of 115.246 (19:38.595) gave him a lead of only 0.1 seconds from Weeden (114.819/ 19:42.974)) going into the final lap with Farrell’s 113.274/ 19:59.113) consolidating third from Akroyd (112.555 (20:06.770) with Evans 111.636/ 20:16.700) completing the top five. The scene was set for a thrilling last lap and all eyes were on the leading pair at Glen Helen with Dudgeon extending his lead over Weeden, albeit only to 0.5 of a second. Farrell was reported off at Glen Helen and taken by airmed to Nobles Hospital with arm and shoulder injuries which meant that Akroyd moved into the top three with Evans and Moulai completing the top five at Glen Helen. The leading pair were enjoying a thrilling battle with Weeden moved back into the lead at Ballaugh, albeit by only half a second, but Dudgeon again moved in front at his home town of Ramsey with a 2.5 second gap to the second man. Dudgeon also, appropriately, became the 9th rider to join the ‘Tommy Club’ for 120mph Manx Grand Prix riders, named after Tommy Clucas who was the first to break the barrier in the 2004 Junior MGP. Joe Ackroyd with 115.823/ 1:18.10.872 took the final podium place with Barry Lee Evans (115.344/ 1:18.30.372) and Moulai (115.198/ 1:18.36.319 completing the top five. Wayne Humble was the best placed newcomer going into the last lap but the Alston man was running in an excellent 7th when he was reported to have come off at Governors on the last lap when running in 7th place, leaving local rider Brendan Fargher in 13th as the highest placed newcomer. Humble was reported to be complaining of pain in his shoulder and leg following his last lap slide while James Robertson was described as conscious and talking after coming off at Black Dub. Steve Moody was also described as conscious after an accident at Keppel Gate. Andrew Dudgeon congratulated by Tom Weeden and Joe Akroyd in the winners' enclosure after the Mylchreests Junior MGP.